It usually takes few months for someone to learn techniques of wearing a kimono. Even when you have knowledge of dressing kimono, it still takes about 45 minutes to wear. Solo Kimono is easy, relaxed fit and takes only 3 minutes to wear. It is designed for anyone who doesn’t have much knowledge of kimonos. 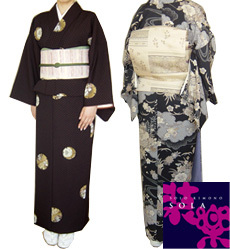 Unlike a standard kimono which requires drying in shade, special folding technique, needing strings, SOLA is washable and no need and preserve in a special kimono case, special care but just hangine at any time. It is made with high qualified materials and wrinkle free. Roll it up, put it in your bag and wear it for dinner at your next travel destination. Various kimono for funeral, parties and usual wear are on the way youcan chose scene by scene by scene and season by season. People used to wear kimonos, the Japanese traditional dress, as their everyday clothes. However, the opportunity of wearing it has reduced since it’s expense, difficulty to wear and the need of extra care. The concept is to appeal the beauty and ease of kimonos to a younger generation and show how fun it can be to wear,It's to come back the Japanese kimono culture more accessible again. Copyright (c) TRAIN All rights reserved.